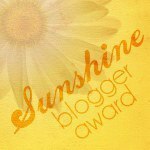 I am excited to be accepting the Sunshine Blogger Award today after being nominated by the lovely Amy over creator of the Silver Linings Project blog. This award is all about bloggers noticing other bloggers that are being positive and inspiring. This means a lot to me since this my first award ! I am really grateful as I continue to share what’s on my heart. * Reference and link to the person who nominated you! 2. I played flute for a few years. It took me an entire month to play a note when I started learning flute in 5th grade! I didn’t give up, won lots of solo awards, and became first chair a few years later in band. 3. I used to like the smell of gasoline when I was younger. No idea why, but glad I have grown out of it. 4. My first job was a usher at an outdoor concert theater. In high school I got to enjoy Jimmy Buffett, Dave Matthews Band, Jay-Z, Nas, Usher, Poison, and a host of other artists for free. Good times indeed. 5. Spiders. I don’t think I have arachnophobia but spiders (especially bigger ones) can make me do extreme things like scream and jump on chairs. 6. I had the biggest crush on Brandy’s brother Ray J when I was in middle school. He only had a handful of songs but you better believe I knew them like the back of my hand. 7. I was not a fan of portraits when I was younger. My pictures from three to about seven, I made it a point to frown, much to my parents dismay. My rebel side was trying to come out. Those pictures have now become my parent’s favorites. 8. I met Oprah and Martha Beck. I got to tell them the story of how me and my husband kept our marriage a secret for two years. It was live at the studios and I was in the front row. Great memory for me and my husband. You can see my 5 seconds of fame if you fast forward to minute 22:40 of this video. 9. I love Crock Pot cooking. Easy. Convenient. Yummy. all at the same time? Yes! 10. America’s Next Top Model is my all time favorite reality-competition show. I haven’t missed a season since it premiered back in 2003. 1. What is the first thing you do as soon as you wake up in the morning? Take a deep breath and say thank you, expressing gratitude for life. 2. What is your greatest fear? Suffocating or drowning. Just don’t want to imagine not being able to breathe. 3. Do you have a new years resolution for 2014? Becoming a full time writer. 5. What is your favorite childhood memory? My mom taking me and my brother to the library every Saturday morning. That’s where my love of books started. 6. Facebook or Twitter? Right now, it’s Facebook. 8. What bugs you the most? When people don’t pay attention to what people are saying because they are distracted by phones or computers. 9. What do you consider to be the most important appliance in your house? the stove. I love cooking and we no longer own a microwave. 11. What’s your favorite movie quote? Anything from the Notebook but this is my favorite: “So, it’s not gonna be easy. It’s gonna be really hard. We’re gonna have to work at this every day, but I want to do that because I want you. I want all of you, forever, you and me, every day.